Optionally available with available ES, or Extended Squitter, technology the GTX 330 takes the lead in providing an affordable pathway to ADS-B compliance for the Next Generation airspace system. Using precise GPS-referenced positioning information, the extended squitter technology enables transponders to automatically transmit more accurate, and more useful, traffic surveillance data — including aircraft flight ID, position, altitude, velocity, climb/descent, and heading information (compared to traditional Mode S and Mode C transponders, which can only broadcast altitude, and thus require ground-based radar to correlate and identify the aircraft's position). Do I have an ES transponder? Does it meet current ADS-B "Out" requirements? To understand if your GTX 330 is an ES version, pay attention to the splash screen when your avionics are being powered on. You'll see either "GTX 330" or "GTX 330 ES." This should make it clear which version you have. The same is true of the remote GTX 33. It should be noted that the GTX 23 is only available with an ES. If you do not have an ES version, an upgrade is available for a fee. For customers with an existing ES transponder, an update to meet the ADS-B requirements will be free of charge. However, some labor and handling charges may apply. Your Garmin dealer can make arrangements for this upgrade. Existing GTX ES transponders need to have their software updated before they are ADS-B compliant. You can get this upgrade right from your authorized Garmin dealer. 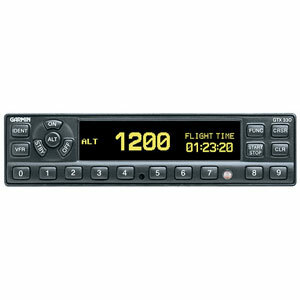 Upgrades from a non-ES transponder to an ES transponder will require your dealer to ship the unit back to Garmin for the upgrade. Will the GTX 330 ES, GTX 33 ES or GTX 23 ES transponders display traffic via the FAA’s TIS-B ADS-B uplink? The ES transponders currently have the capability to uplink the FAA’s TIS-A traffic (consult the question below regarding differences between TIS-A and TIS-B traffic). There are currently no plans to update the transponder to uplink from TIS-B.